United Airlines recently launched a new version of its smartphone app, which has a new feature that is especially useful for frequent travelers. The new feature is flight-delay notification. And what makes this feature especially interesting is that the notification explains why the delay happened and what is happening to fix the situation. The app also updates customers at every step of their travel journey. What other features were added to the United Airlines app? It includes a navigation bar that gives customers quick access to popular tools like flight status and My Trips. The My Trips tab in the navigation bar allows customers to easily access information about their upcoming trip and it stores boarding passes when customers are checked in for their flights. There is an inbox that stores important push notifications United sends customers about their flight like if a flight status changes, gate changes, and alerts about when boarding for a flight has begun. 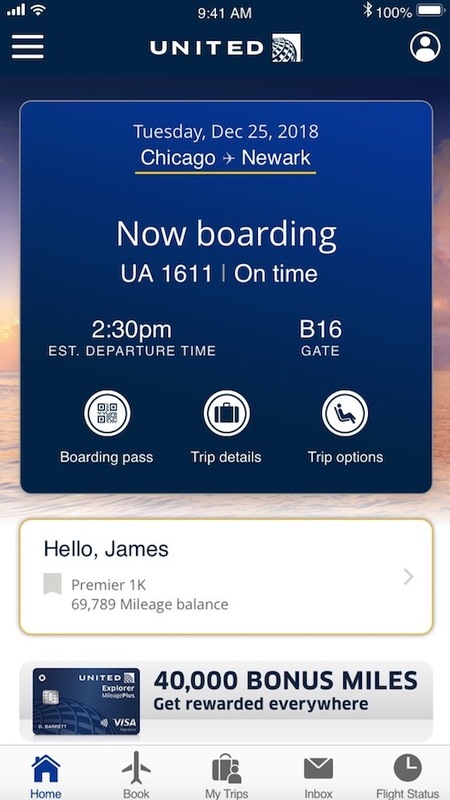 Plus dynamic boarding times are updated throughout the app in the event that departure times change to give customers the latest information even when they are not at the gate. This feature builds on United’s recent addition of boarding notifications, which were added when United launched its Better Boarding process. During the travel period, the home screen updates customers with the most helpful information for every step of their travel journey. The home screen starts to update 48 hours before a flight. And it continues to update throughout the various phases all the way through arrival at the final destination with the most useful information. Customers will see a screen that allows them to easily access airport maps so that they can easily navigate to their next gate. And it also shows the most useful information that makes the entire journey less stressful and more intuitive. Plus the United app also features an updated design with more engaging content. For example, the app will show a beautiful destination image to provide travel inspiration. And content on the home screen will be personalized for each user. For example, customers who recently passed loyalty milestones will be recognized on the home screen. United’s in-house digital team spent more than a year designing and creating the app, including eight months during which customers and over 18,000 employees provided feedback to create the final version. About seven beta releases were issued before the final version.